Gaggenau is a small town in the Murg River Valley at the northern edge of the Black Forest. The Gaggenau factory was founded in 1683. The 20th Century saw Gaggenau grow into an internationally renowned premium brand, robust oven enamel became the resounding success of Gaggenaus coal and gas ovens which continued to thrive throughout the century. In 1961, passionate hobby cook and visionary Georg Von Blanquet took over the reins of the company. His revolutionary built in kitchen appliances shaped the Gaggenau brand with their professional function, quality and understated aesthetics. Since 1995, Gaggenau has been part of the BSH Group with locations in over 50 countries; Gaggenau is now considered the worlds premier kitchen appliance design brand by architects, designers, chefs and design enthusiasts alike. 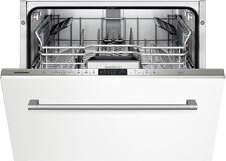 Numerous professional appliances now used everyday in domestic kitchens originally began life at Gaggenau. Design – Inspiration from professional kitchens to create restaurant quality appliances for the modern home. Without compromise, but with beautiful timeless design and innovative technology. Form – Create products with sleek surfaces & linear rule to reflect their subtle understated ethic. Detail – Excellence is evident in the products Gaggenau craft and can even be found in the smallest details. In fact their entire range is characterised by flawless functionality and ease of operation. “Less is More” is the mantra of Gaggenaus head designer Reinhart Segars when approaching the design. The beauty of Gaggenau products is derived from their desire to create timeless form that translates smoothly into superb function.